An implant used to replace a single missing tooth can easily and predictably achieve the desired aesthetic result in the presence of abundant bone and gum tissue. An implant crown placed over the single implant will look, feel, and function like a natural tooth. By placing the implant in place of the missing tooth, the neighboring teeth will not need to be shaved down to act as abutments. It will maintain the natural bone contour which would otherwise develop under a bridge, maintaining a natural tooth and gum contour. When multiple teeth that are located next to each other have been pulled, bone deterioration occurs to a greater extent than with a single missing tooth. By using implants to replace the missing teeth, we are essentially replacing the missing tooth roots, which help maintain proper bone contour. Preserving the jaw bone and preventing permanent bone deterioration will help maintain gum tissue to avoid further gum collapse and prevent the “sunken-in” look. It will also help maintain the outer facial features by maintaining cheeks and lips in a natural and aesthetic position. When replacing multiple missing teeth, dental implants can be used to support an implant bridge, which is either permanently cemented over or screwed into the implants and will not move around like dentures or partials. An entire jaw of missing teeth can be restored with dental implants placed in strategic positions with single or multiple bridges, overdentures, or hybrid dentures. Patients that have been long-time denture wearers, who have loose dentures or are unable to have a denture stay in place, would benefit from dental implants the most. Depending on the budget, a 2 implant overdenture would be the basic and most economical option to address a loose or poorly fitting denture. The 3 or 4 implant overdenture would provide even greater stability and retention, keeping the prosthesis fixed in position while allowing easy maintenance and home care. 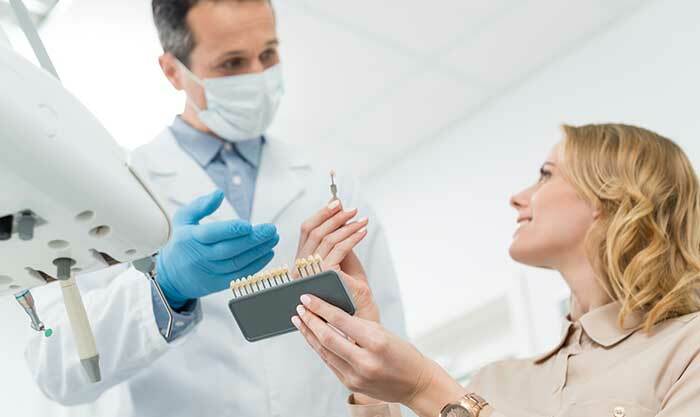 A non-removable option to replace a denture is also available, but depending on the quantity and quality of bone, bite, and other factors, 6-8 implants should be utilized and spaced strategically for the restoring dentist. The dental implant replaces the lost tooth root and acts as a post for the implant crown. Grinding down the neighboring teeth is not necessary, allowing the healthy teeth to be preserved. Dental Implants not only look like your own teeth, but they also feel like them. The implant, crown and gums form a harmonious unit. If you are looking for more information on tooth replacement, give us a call at our Palm Beach Gardens office today!